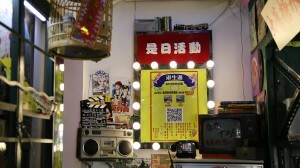 Note: Embedded above is the Map of the Hongkou Neighborhood that we explored . The Green-colored path is the travel path for someone interested in a self-guided tour. The Red-colored path is most famous for its breakfast food. Shanghai is a city where the eastern and western culture amalgamate to create something wild and extraordinary. It is a city where old houses and skyscrapers co-exist with each other without conflicts to add a subtle touch of modernity to the vintage. A city that never sleeps and where people from all around the world come to travel, work, and study. Such is our group that consisted of three people from all around the world, and together went to explored one of the most artsy and legendary areas in Shanghai- the Hongkou area. 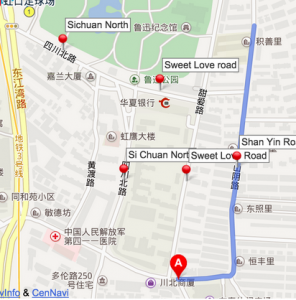 The first area consists with three roads: Si Chuan North Road （四川北路）, Sweet Love Road （甜爱路）and Shanyin Road （山阴路). This area reverberates the life of old Shanghainese people and also preserves a strong ambience of literature and art as the most famous, leading figure of modern Chinese literature, Lu Xun, lived on Shanyin Road. 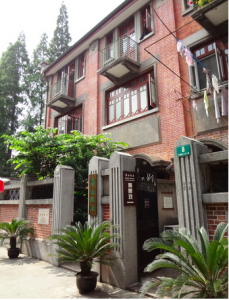 In addition, his friends, including famous social activists and other literary intellectuals from his time, all lived on the perpendicular Si Chuan North Road. 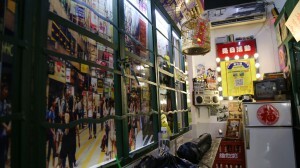 Instead of the serious atmosphere of history rudiments, this area is incredibly lively and energetic. It is probably because Si Chuan North Road for old Shanghainese people is the third biggest business street after East Nanjing Road and Fu Zhou Road. Si Chuan Road mostly caters to the blue-and-white-collar workers, and therefore in comparison to East Nanjing Road, Fu Zhou Road and Huai Hai Road, Si Chuan North Road is not that fancy and still has a unique, Shanghainese taste instead of getting influenced by the westernization. 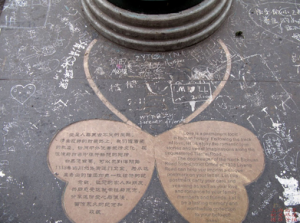 Sweet Love Road is the most romantic road in Shanghai. While walking down the street, you can not only enjoy the shadow brought by plane-tree, but also enjoy 28 poems about love on the wall along the way. Lu Xun and his wife always walked down this road after dinner, which explains the romantic name of this street. We explored this area three times in total. We still remember the first time Guillermo said to us when we were walking down Shanyin Road: “Dude this should be how Shanghai look like, I feel like I am completely emerged.” Yes, this area is using its breakfast vendors who make their own french style old house as restaurant, its road full of plane-trees and foreign-style old houses that reiterate that you’re indeed in Shanghai. 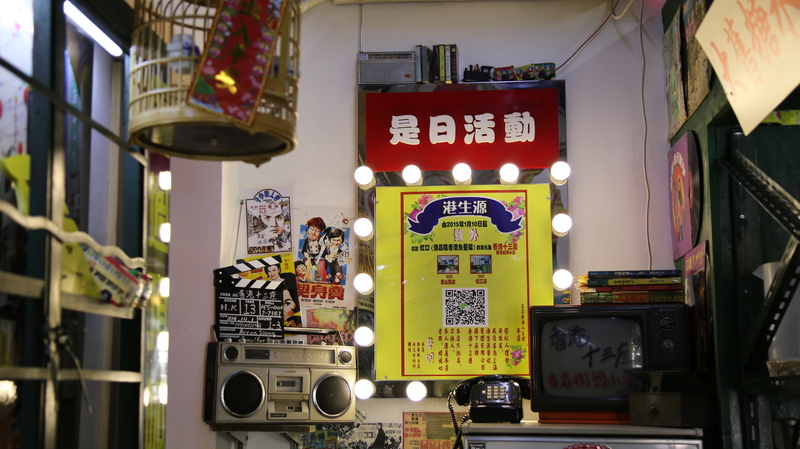 No matter how westernized Shanghai becomes as a result of globalization, this neighborhood is a constant reminder of the interesting history Shanghai has for people to discover. HongKou area is not only full of legendary men of letters and social activists, but is also famous for Shanghai Ghetto; formally known as the Restricted Sector for Stateless Refugees. It was an area of approximately one square mile in the Hongkew district of Japanese-occupied Shanghai (the southern Hongkou and southwestern Yangpu districts of modern Shanghai). The area included the community around the Ohel Moshe Synagogue but about 23,000 of the city’s Jewish refugees were restricted or relocated to the area from 1943 to 1944 by the Proclamation Concerning Restriction of Residence and Business of Stateless Refugees. It was one of the poorest and most crowded area of the city. As you get off the Dalian Road subway station, on the left side of road you will notice the western style united villas while on the right side the modern mansions. After walking for five minutes, you will notice the most typical jewish architecture that indicates that the jewish people ran all the way to shanghai to escape the massacre, start afresha and make a living. That architecture is Jewish Refugee Museum, which is also called Ohel Moshe Synagogue. 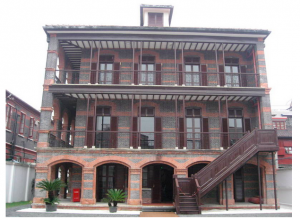 The Ohel Moshe congregation was established by Russian Jewish immigrants in Shanghai in 1907.This Ashkenazi congregation was named after Moshe Greenberg, a member of the Russian Jewish community, and was first established in a rented space. Different from the petit bourgeois sentiment in French concession, in Jewish refugee museum ,what you can feel is a sense of vicissitudes. Shanghai is not only a place with beautiful appearance and decent happiness, it is also a place full of serious history and a huge amount of it are life and death stories. This area is extremely lively during the daytime and early evening because not only there are a lot of office workers walking to and from HongKou football field every day, but also the old people (especially local Shanghainese people) love to go out and do some physical exercise in Lu Xun memorial park in the early morning and after dinner. But during the late night, this area is a kind of wind down because this area doesn’t have some entertainment facilities, such as bars and clubs, so while comparing to daytime and early evening, the nights are usually very quiet in this old shanghainese area. 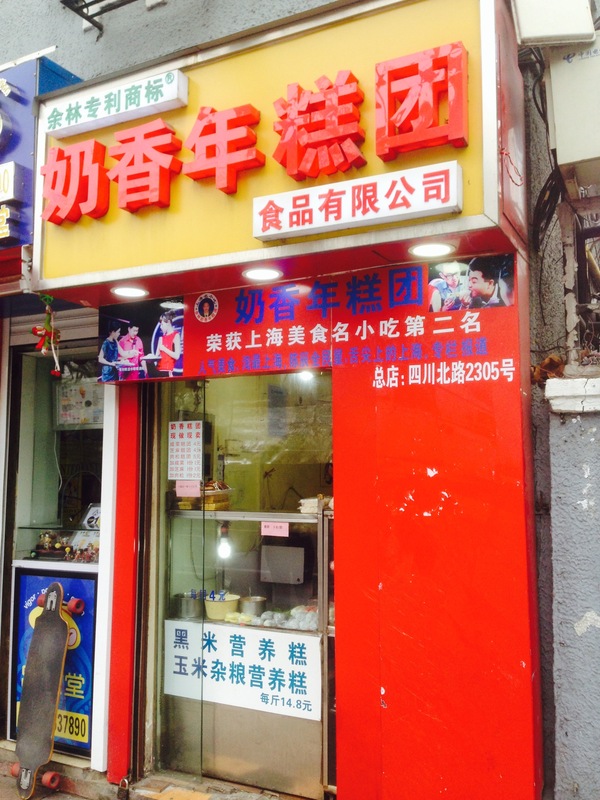 The food, on an average, costs around 10-15 RMB around this neighborhood. 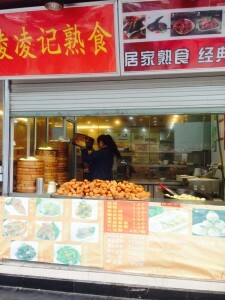 The spring onion pancake cost 2-5 RMB on an average. Whereas the neighboring area is relatively more quieter and serious. One of the reason why this area is sometimes lively is because of the tourists who visit jewish refugee museum. Day time and night time does not have a significant difference in this area but for the street food vendor who we interviewed (the spring onion pancake owner), daytime means a prosperous business, while the night time means more happiness and relaxation being with the family in addition to the preparation for next day’s food. 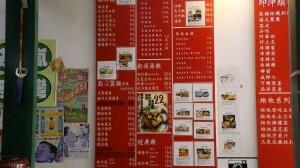 The food, on an average, costs around 20 RMB around this neighborhood. One of the street food vendors we interviewed was from Suzhou and made Spring Onion Pancakes. He told me Spring Onion pancake was originated from Suzhou and his ancestor brought this food to Shanghai in order to have better business opportunities. Therefore, the old Shanghainese have a special, emotional bond with this food. 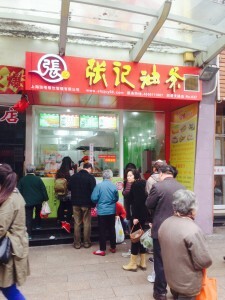 Spring onion pancake has already become an inevitable part of the Shanghainese food culture. We have previously heard about this place for a while since the owners of this street food stall is popularly known to have the ultimate secret of making spring onion pancake in all of Shanghai. So far, no imitators has reached his level of expertise yet. After requesting the secret for several times, they told us that the secret ingridient of their delicious spring onion pancake is their homemade onion oil as they keep it traditional and original, and do not let greed overpower their judgement. They said that tall they need int heir life is happiness and stability, which we believe they had already achieved. They said another key factor to making any piece of spring onion pancake is having true passion and cooking with all love and dedication, because if you cook it with true heat, people who are eating it can taste that love and devotion in their food. 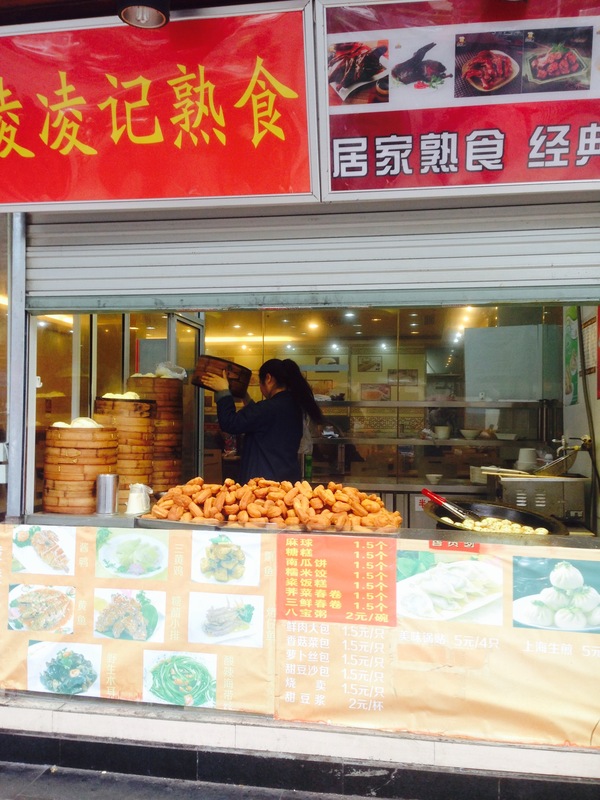 One of the most interesting moments while exploring this neighborhood was when we met a street food vendor on the Shanyin Road. When we first saw the place we were skeptical about the food quality and hygiene considering all the dishes, including the ones with meat in it, were kept out in the open without any covering. We started having a casual conversation with the owner of the street food stall, who was shy in the beginning but was super excited to talk to us later when we told her about this class. She told us about how their stall has been in business for the last 15 years and people from all walks of life come to her stall all through the day. We were most surprised when she told us that the majestic house behind the stall was actually owned by her family. While the whole setup looked sketchy in the beginning, we were amazed to see a typical, old French Concession style house with high ceiling and dining room that acted as a small, functional restaurant. 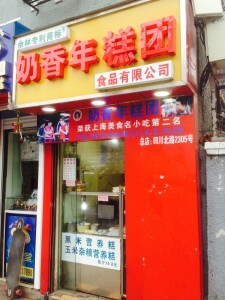 She explained us the whole setup where they people could experience both the street food experience if they sit and eat outside, and also have a decent dining experience while eating homemade food inside their authentic shanghainese house while having a remarkable Shanghainese experience. The lady was very kind and let us explore her house. We saw the kitchen inside and everything surpassed our expectations. Later, after a short conversation, she told us about her son who is currently studying in Beijing, the hometown of one of our team members, Amy’s. The lady also told us how she was extremely proud of her child and more proud that their income as a street food vendor supported the entire family’s expenses. In addition, she also told us that she enjoyed working everyday for the last 15 years, does not feel threatened by the new restaurant that have recently opened up in the neighborhood, and does not plan on stop working anytime soon.